In 2009, the Dolomites were added to the list of UNESCO World Natural Heritage sites, and the bright limestone formations of the Catinaccio and the Latemar attract climbing enthusiasts from all parts of Europe. The steep rock towers, jagged ridges and stone formations are a climbing paradise offering many climbing routes. Spectacular trails of varying difficulty lead to the peak of Catinaccio d’Antermoia, the Santner Pass and the Croda Rossa. The climb starts at the Paolina Hut, across the narrow Vajolon Pass up to the top at an altitude of 2,806 meters. The descend follows the same route, and the valley can be reached by chairlift from the Paolina Hut. 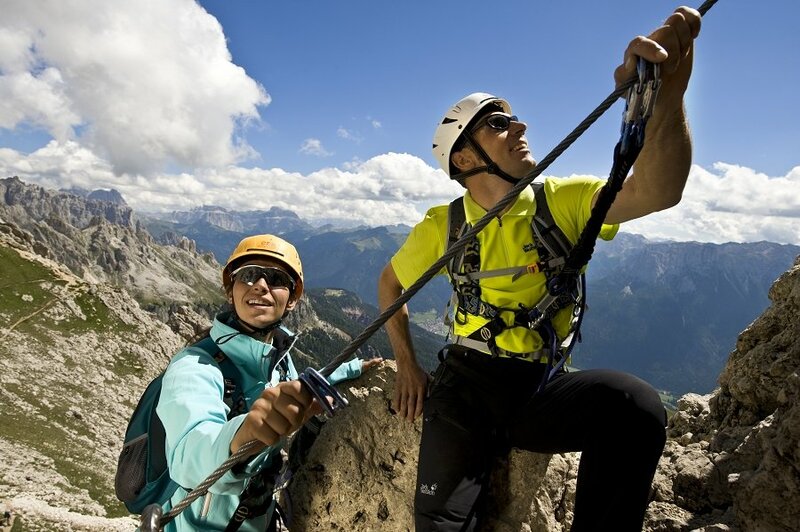 The via ferrata Masare takes you to the 2,585-meter Masare Peak, where you may enjoy a fantastic view over the South Tyrolean Val d’Ega. In the summer months, children and adults may participate in a climbing course for beginners in a climbing park, and with professional instructors acquire the necessary skills for a climbing tour. In the climbing park at Lake Carezza you will learn the essential safety techniques and gain experience on the rocky wall. Only five minutes by car from the farm Karerhof, there is the small Croda Rossa, which is one of the most beautiful climbing areas in South Tyrol. On the white and rocky Dolomite wall you may experience overhanging climbing on ledges and holes. The climbing tracks lead from the sector “Blocks” into the forest. 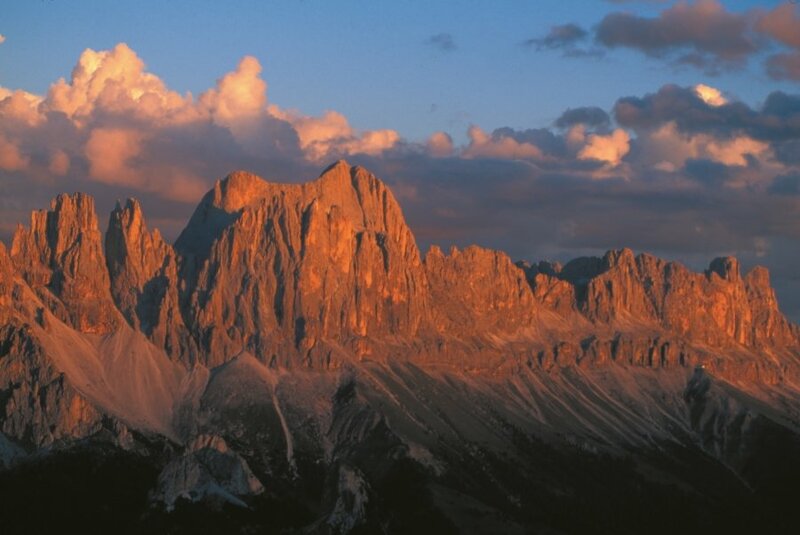 The pointed rocky spikes of the Vajolet Towers in the Catinaccio count among the most popular regions for alpine climbing in the Dolomites. Many short itineraries to the summit have a medium level of difficulty. The starting point is the lodge Gartlhütte at the foot of the rock wall or the lower Vajolet Hut. 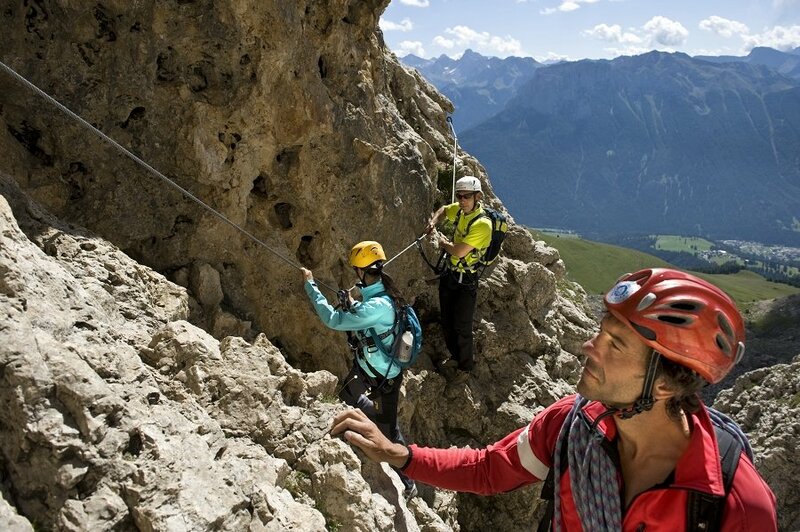 Another spectacular experience is a climb to the top of the Catinaccio – The up to 600 meters high East Wall fascinates climbing enthusiasts from all over South Tyrol. The apartments at the farm Karerhof in Nova Levante are the ideal starting point for exciting climbing tours in the Dolomites. The farm is located at an altitude of 1,450 meters and is towered by the distinctive peaks of the Catinaccio. Santner Pass, Masaré, Croda Rossa, Campanili del Latemar (Masaré and Croda Rossa are the most popular). Small Croda Rossa, only 5 minutes by car from the farm Karerhof. One of the most beautiful climbing areas in South Tyrol. Courses for beginners are offered.